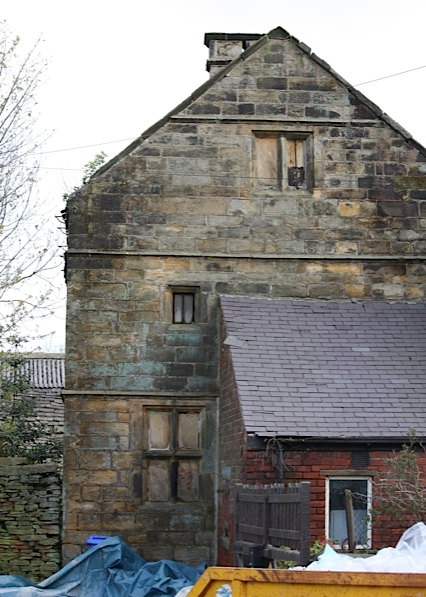 Edward and Amelia Appleyard of the Old Hall in Brightholmlee had 4 children; Jo, Mary, Mildred and William. William, or Uncle Willy, as Tom Shaw his 92 year old nephew calls him, like many young men of the time; bravely went off to fight in the Great War of 1914 – 18 at the age of 27. 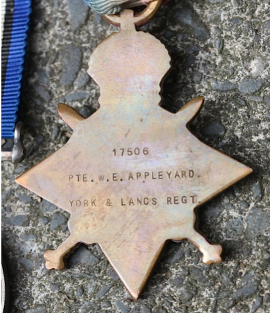 He began in the Navy but disliked it so much, he threw his boots over the side of the ship and as a result was transferred into the York & Lancs Army Regiment! After the end of the WW1 he stayed in the army serving with the Royal Artillery Defense Corps, serving in what is now known as Iraq. He returned home to Brightholmlee around 1920, never married and died an alcoholic 10 years later at the age of 43 in 1930. Uncle Willy was the last person to live in the Parlor Block to the right of Brightholmlee Old Hall, a once very grand 17th Century house but now in disrepair. 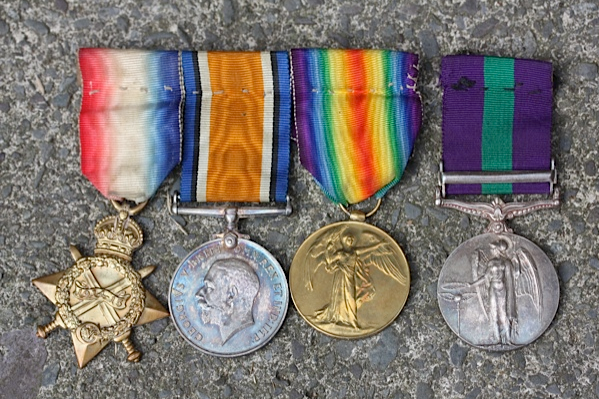 During the clear out ready for the sale of The Old Hall, 4 army medals from the 1st WW have been found. These together with a few empty bottles strewn on the Parlor Block floor are all that remains of Uncle Willy. Tom’s only memory of him was that he heard that Uncle Willy had once cut 4 acres of corn with a hand held scythe around the Rush Ing fields. We would like to remember his sacrifice, we don’t know if he performed any outstanding acts of bravery or was mentioned in dispatches. All we do know is that this man survived the Great War and served in Iraq only to end up in a semi derelict house dying alone of alcoholism. There was little understanding or awareness around post traumatic stress disorder in those days, no “Help for Heroes” as there is now. It’s highly likely that his experiences during his war time service led to his early death. As part of the Brightholmlee Boundary Tree Planting Project, we’d like to plant a tree dedicated to Uncle Willy, to honor the sacrifice he made. If, like us, you’re touched by his story, we’d really appreciate some help in raising the funds to install a boundary tree for him. We need to raise £130 and if you would like to make a contribution, please contact us via our Contact Us page. This, together with the rest of the Brightholmlee Tree Project, will be recorded in a special book that is to be archived with Bradfield Parish Council for 200 years. Thank you so much and check out our website for news of the fund’s progress, where the tree will be planted once the money has been raised and how to make other tree dedications.